The short version: Even if you only rarely cook at home, you need to buy this cookbook. It’s out of print but there are a few cheap copies left on the secondary market through Amazon so you might be able to get one if you hurry. The longer explanation: One of the sub-tasks in my Well Stocked Pantry project has been to identify the top 30 or so cookbooks in the world, as regarded by real people and tested in the real world. Boxes of tomes have been delivered to my home for the past week, and I have been working my way through many of them, ranging from topics as varied as sauces to chocolate making. [mainbodyad]Last night, I had some fresh cream that had been opened and needed to be used, so I decided to make my grandmother dinner and bring it to her. 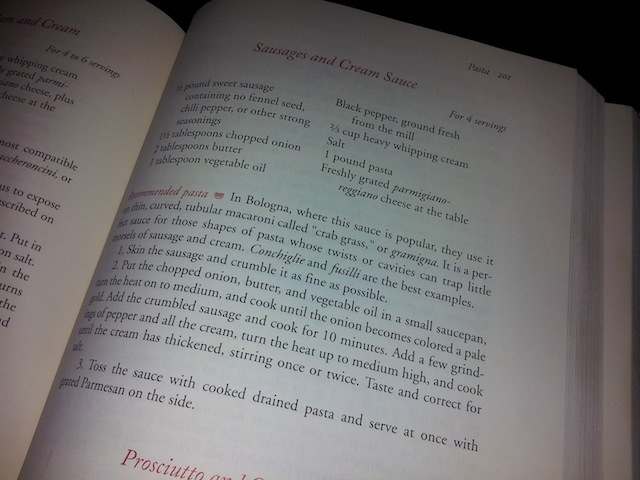 I reached for one of the books, the Essentials of Classic Italian Cooking by Marcella Hazan and found a recipe for Sausages and Cream Sauce. 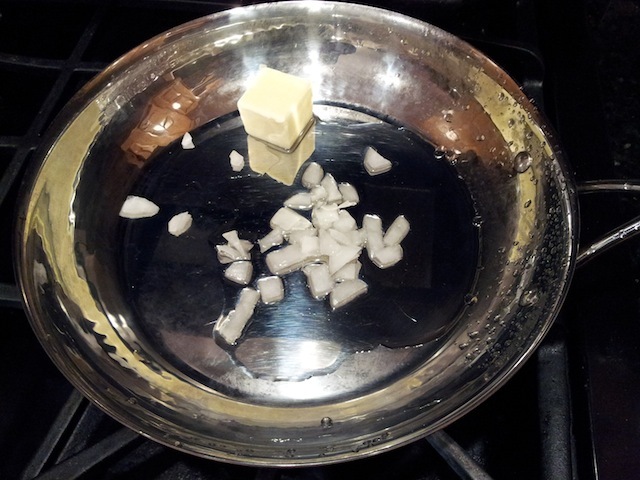 I grabbed a copper sauce pan, put it over the flame, and began cooking. In roughly ten minutes, this simple, no-frills recipe had yielded a result that, were it offered in an Italian restaurant, I would have returned as a regular to enjoy. Now, you know we love Italian food. There is nothing quite like a good pasta dish. The sauces; the flavors; it’s magic when it all comes together. Hazan’s reputation is deserved. I was so intrigued by the book living up to its reputation that I am now testing out many of the other dishes in it. Time and time again, the food is amazing, proving, in many cases, there really is wisdom in crowds. These recipes are so simple, which adds to the magic. They are almost impossible to screw up if you can follow basic instructions. The steps involved are far fewer than many of the other recipes I’ve talked about over the years, such as the delicious corn chowder. You could be a full time working parent and still produce the type of food people rave about by simply having a few basic ingredients on hand to simmer a sauce after you come home from the office. 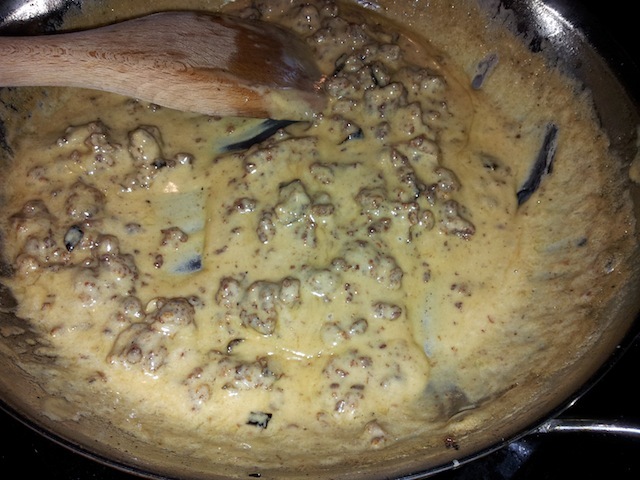 Here are photographs to show you how straightforward and nearly effortless the sausages and cream sauce was from the book. 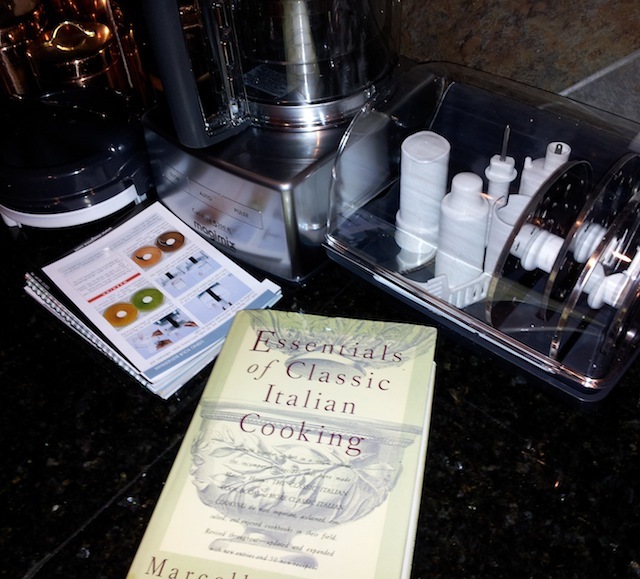 Essentials of Classic Italian Cooking Cookbook – It’s been out of print for more than twenty years but a few cheap copies still exist on the secondary market that you can get to fairly quickly if you hurry up and buy before the inventory is depleted. 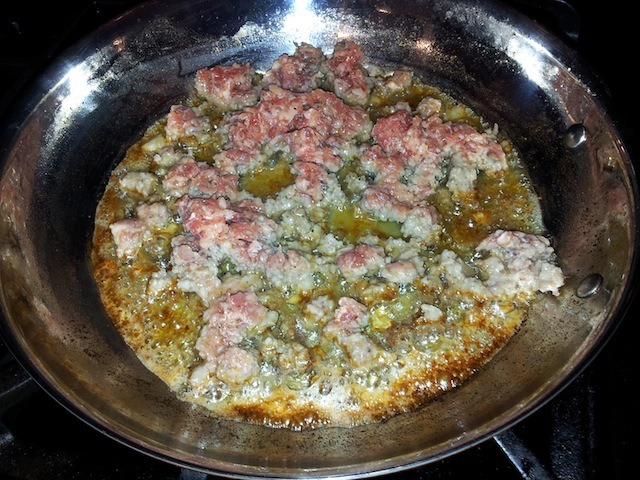 Italian Sausages and Cream Sauce Recipe – This is the first, basic, simple sauce I tried from the book. It was magnificent. Interesting side note: This book, published in 1992, was an adaptation of one of the author’s earlier works from 1978 by a slightly different name. Some insist the earlier version is superior. Many say there is no difference. I bought both copies but have not gathered enough evidence to have an opinion. Regardless of how how those tests turn out, it is clear this is one of the best, basic Italian cookbooks I’ve ever come across. If I had to build a core collection with only ten books in it, it would be in there. Update: I published pictures of another walkthrough from this cookbook; a tomato sauce with onion and butter, which we served over penne pasta.